Name: Some people call me Nina Zivancevic, some call me Lea, and very few Kunsang Palmo. Location: I was born at the far boundary of the former Ottoman empire, in a city called Beograd ("White city"), former Yugoslavia, but I've lived most of my life in NYC and have been in Paris now for the last 24 years. Occupation: I share my impressions about art, life, and literature with those who might listen to me at la Sorbonne in Paris. Poetry means everything to me—whatever I do, breathe, sing and cook, growl, howl and whisper, I do via poetry. I don't have favorite poems or poets—all of them are dear to me, are my extended family—but if I were really pushed to whisper a name among the names I love in poetry it would be the name of the poet who metaphorically tapped my shoulder while saying "you're ok, just go on, breathe freely, in the street and in verse," Frank O'Hara, American poet of the 20th century who threw a challenge/glove in the face of Modernity and, alas, died very early. The poem I would like to remember here and which means so much to me is "Meditations in an Emergency." I've held close to me a version in Donald Allen's edition of The Selected Poems of Frank O'Hara, published by Vintage Books in New York, 1974. Frank O'Hara's "Meditations in an Emergency" is a pivotal poem in the work of the poet. It's an ambiguous text which changed my youth and my poetry stance forever. I loved it so much that I even started writing a doctoral dissertation on it. Alas, I never finished this project and left it in the 1980s. 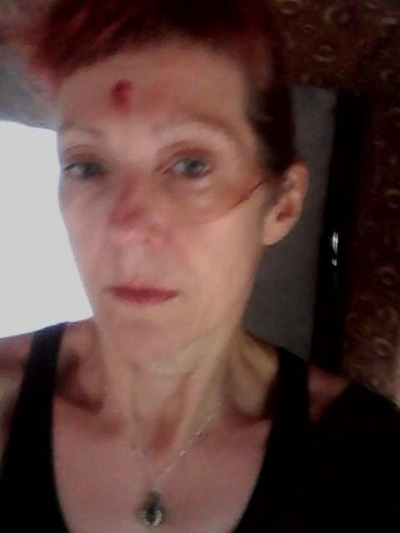 Am I to become profligate as if I were a blonde? Or religious as if I were French? Each time my heart is broken it makes me feel more adventurous (and how the same names keep recurring on that interminable list! ), but one of these days there’ll be nothing left with which to venture forth. Why should I share you? Why don’t you get rid of someone else for a change? I am the least difficult of men. All I want is boundless love. Even trees understand me! Good heavens, I lie under them, too, don’t I? I’m just like a pile of leaves. However, I have never clogged myself with the praises of pastoral life, nor with nostalgia for an innocent past of perverted acts in pastures. No. One need never leave the confines of New York to get all the greenery one wishes—I can’t even enjoy a blade of grass unless I know there’s a subway handy, or a record store or some other sign that people do not totally regret life. It is more important to affirm the least sincere; the clouds get enough attention as it is and even they continue to pass. Do they know what they’re missing? Uh huh. My eyes are vague blue, like the sky, and change all the time; they are indiscriminate but fleeting, entirely specific and disloyal, so that no one trusts me. I am always looking away. Or again at something after it has given me up. It makes me restless and that makes me unhappy, but I cannot keep them still. If only I had grey, green, black, brown, yellow eyes; I would stay at home and do something. It’s not that I am curious. On the contrary, I am bored but it’s my duty to be attentive, I am needed by things as the sky must be above the earth. And lately, so great has theiranxiety become, I can spare myself little sleep. St. Serapion, I wrap myself in the robes of your whiteness which is like midnight in Dostoevsky. How am I to become a legend, my dear? I’ve tried love, but that hides you in the bosom of another and I am always springing forth from it like the lotus—the ecstasy of always bursting forth! (but one must not be distracted by it!) or like a hyacinth, “to keep the filth of life away,” yes, there, even in the heart, where the filth is pumped in and courses and slanders and pollutes and determines. I will my will, though I may become famous for a mysterious vacancy in that department, that greenhouse. Destroy yourself, if you don’t know! It is easy to be beautiful; it is difficult to appear so. I admire you, beloved, for the trap you’ve set. It's like a final chapter no one reads because the plot is over. “Fanny Brown is run away—scampered off with a Cornet of Horse; I do love that little Minx, & hope She may be happy, tho’ She has vexed me by this Exploit a little too. —Poor silly Cecchina! or F:B: as we used to call her. —I wish She had a good Whipping and 10,000 pounds.” —Mrs. Thrale. I’ve got to get out of here. I choose a piece of shawl and my dirtiest suntans. I’ll be back, I'll re-emerge, defeated, from the valley; you don’t want me to go where you go, so I go where you don’t want me to. It’s only afternoon, there’s a lot ahead. There won’t be any mail downstairs. Turning, I spit in the lock and the knob turns. Yet, first of all, this poem, which does not meet many typical definitions of poetry at all, changed my notion of the literary genre. Yes, O'Hara is funnier than Baudelaire. O'Hara imposes his wit on us, a quality so rare in poetry, perhaps only before found in James Joyce or Jonathan Swift. He starts in mock-epic and ends the poem in banal, noir thriller. There he says very little but claims a lot. Such as, he would like to trade the pillars of Modernism on a bright NYC sunny afternoon for the ladders of postmodern fragmentary joke. But perhaps it is not so much humor but rather a tragic sentiment in his work. Especially when he examines the tradition of heterosexual courtly love (which had been rarely directly questioned in such a way in poetry at the time). He says, "Heterosexuality! you are / inexorably approaching. (How discourage her?)." O'Hara is an inveterate urbanite; he "cant even enjoy a blade of grass unless...there's a subway handy," a sign that "people do not totally regret life." What would go under the key of regretting? Meadows, trees, cottage-cheese, cows, quiet evenings, sunrise, sunsets, shady nights with a lot of rain, furtive kisses, etc. All of this does not belong to O'Hara's poetry. No place to run to, nothing to run away from, chiseled destiny, a poet who is ready to die young. And so be it. The poet died young; he got killed by a beach buggy one summer on the beach, Coney Island of his mind. And then younger poets found him, followed him, built up temples to his verse, started a school known as the New York School of Poetry. OK, OK, Kenneth Koch was in it, too. John Ashbery, James Schuyler, but they lacked O'Hara's brilliant style, unobtrusive elegance, and the decadent wit of the simplest Irishman on Earth. And true, perhaps he was closer to O. Wilde, Joyce, or Jonathan Swift in regards to his ars poetica than to the legacy of his contemporaries. Nina Zivancevic's The Selected Poems of Frank O'Hara, Edited by Donald Allen. 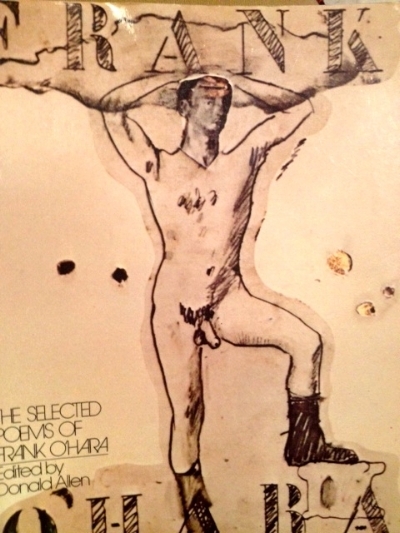 PS: The cover of O'Hara's Selected Poems features his portrairt as painted by his friend and contemporary, the pop-expressionist artist Larry Rivers.